West Yorkshire is a metropolitan county within the Yorkshire and the Humber region of England and came into existence as a metropolitan county in 1974 after the passage of the Local Government Act 1972. The county is landlocked and consists of five boroughs the City of Bradford, Calderdale, Kirklees, City of Leeds and City of Wakefield and shares borders with the counties of Derbyshire to the south, Greater Manchester to the south-west, Lancashire to the north-west, South Yorkshire to the south-east and North Yorkshire to the north and east. West Yorkshire has the most built up and biggest urban area within the historic county boundaries of Yorkshire and lies almost entirely on rocks of carboniferous age which form the southern Pennine fringes in the west and the Yorkshire coalfield further eastwards. In the very east of the county there are younger deposits of magnesian limestone. The Bradford and Calderdale areas are dominated by the eastern slopes of the Pennines producing many steep-sided valleys with a network of roads, canals and railways. This large scale industry and urban area creates views of a wonderful mixture of open countryside, settlements and surrounding hills. The Yorkshire coalfield is a rolling landscape of hills, escarpments and broad valleys with many converted or derelict mine buildings and recently landscaped former spoil heaps. The magnesian limestone belt to the east of Leeds and Wakefield is an elevated ridge with smooth rolling scenery and dry valleys dotted with many country houses and estates with parkland, estate woodlands, plantations and game coverts. Bronte Country is an area of the south Pennine hills to the west of Bradford and is named after the Bronte sisters. Haworth is a hilltop village in the heart of Bronte Country close to Keighley and not far from Bradford. The village is situated above the Worth Valley on the moors of the Pennines and its cobbled centre is rather attractive with its old buildings, tea rooms, souvenir shops, restaurants, pubs and hotels. Haworth is an ideal place for exploring Bronte Country famous for the Bronte sisters, Charlotte, Emily and Anne, who ?respectively wrote the literary classics such as Jane Eyre, Wuthering Heights and Tenant of Wildfell Hall. The Bronte sisters were born in Thornton on the outskirts of Bradford, Charlotte in 1816, Emily in 1818 and Anne in 1820, and they moved to the Parsonage in Haworth with their parents, brother, and two elder sisters in 1820. The house where they were born still exists as the Bronte Birthplace on Market Street in the centre of Thornton and is open to visitors by appointment. The Parsonage was where the sisters got their inspiration and wrote most of their work under masculine fictitious names because of the custom of the times practised by female writers. It is now the Bronte Parsonage Museum which is maintained by the Bronte Society in honour of the Bronte sisters and has become a place of pilgrimage for many thousands of visitors every year. The adjacent Church of St Michael and All Angels is where their father was the curate. Lower Laithe Reservoir is situated to the west of Haworth and together with Ponden Reservoir it supplies water to communities within the Worth Valley and to the Town of Keighley. This scenic reservoir associated with the Bronte’s is popular with tourists and attracts roosting birds and Goosanders throughout the year. Nearby is the small village of Stanbury which is situated on the River Worth and close to the Pennine Way. Bronte Waterfalls and Top Withins are also not far from here and Emily Bronte used Top Withins as the model for the location of “Wuthering Heights” and nearby Ponden Hall the model for “Thrushcross Grange” in the same novel. There are two pubs in Stanbury the Wuthering Heights and the Friendly. Top Withins is a ruined farmhouse on the Pennine Way associated with the Earnshaw home in Emily’s novel. The buildings bore no resemblance to the house she described but the situation may have been in her mind when she wrote of the moorland setting of the Heights. The Bronte Waterfalls is a small waterfall and the surrounding area is mainly moorland and farmland. It is an area of outstanding beauty and the Bronte’s spent many an hour there. Below the falls there is an old stone bridge across the South Dean Beck called Bronte Bridge which was destroyed by a flash flood in May 1989 and rebuilt in 1990 a plaque marks the event. The Bronte Waterfalls is at its best after heavy rain, in dry weather it can be but a trickle. Close by there is a stone in the shape of a chair known as the Bronte Chair. 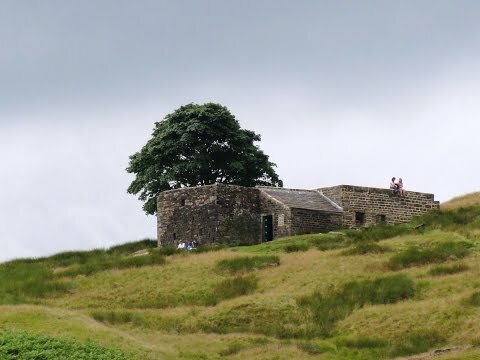 The Bronte Way is a 43 mile long distance footpath which starts at Oakwell Hall (Fieldhead in Charlotte Bronte’s novel “Shirley”) near Birstall in Kirklees near Bradford and ends at Gawthorpe Hall in Padiham near Burnley in Lancashire’s Pendle Witch Country. The route passes through many places of interest to Bronte enthusiasts including Bronte Birthplace, Ponden Hall, Wycoller and Haworth. Scenic highlights include Penistone Hill country park, Bronte Waterfall, Bronte Bridge, Top Withins. The Pennine Way often referred to as the back bone of England is 267 miles long and heads north passing through the Yorkshire Dales and the Northumberland National Park ending at Kirk Yetholm just inside the Scottish Border. The Old Naggs Head at Grindsbrook Booth, once the village blacksmiths, is the official start of the Pennine Way. The Keighley and Worth Valley Railway is a preserved steam railway which has been used as a setting for numerous period films and TV series including the 1970 film version of Edith Nesbit’s story The Railway Children, Alan Parker’s film version of Pink Floyd’s The Wall, Last of the Summer Wine and many more. Every year Haworth holds a special 1940’s weekend where locals and visitors don wartime and attire for a host of nostalgic events. The line opened in April 1867 and served the woollen mills that once stood close to the line. There are still some reminders of the textile industry but many of the mills have been demolished and the line was closed in 1962. Local people and railway enthusiasts joined forces to try and save the line and a Preservation Society was formed and the line re-opened to passengers in June 1968. At the car park we turn left following the sign for Bronte Village, Tourist Information, Bronte Parsonage, Haworth Church, Main Street and Toilets. After a look round the village we make our way back to the church and head forwards past the Bronte Parsonage Museum and follow the track to the road. At the road we turn left and take the first left sign posted Penistone Hill. After a short way we take the path on the right to Lower Laithe Reservoir. We turn right following the road by the top of the reservoir then left to pass through Stanbury. We then take the first left sign posted along Back Lane to pick up the Pennine Way to Top Withins 1½ mls. From Top Withins we back track a short way and take the footpath on the right sign posted Haworth 3½mls Bronte Falls 1 ml and follow this until we see a stone bridge over the stream. We turn right here, cross over the bridge and turn left uphill following the track (The Bronte Way) at the other side until we come to a gate and a road. We now take the path opposite slightly to the right sign posted Haworth 1¼ mls via Penistone Hill and then bear left at the next sign post Haworth 1 ml Bronte Way. At the next road we cross straight over and head forwards downhill between two walls. On reaching a path the path opposite leads to the car park but we then turn left and follow the path sign posted Haworth ¼ ml, Rly Children Walk back to the church and then make our way through Haworth to the railway station to watch the steam train come in. This is an easy walk on good tracks and paths over open land and fields. There are some inclines and declines and a two stretches of road. Approx 7.5 miles allow 3 hours using OS Explorer map OL21, South Pennines. Start point: The Village car park off Weavers Hill in Haworth. Pay and Display £4 for all day. Haworth is near Bradford and Keighley in West Yorkshire. From the A1 take junction 47 towards Knaresborough and Harrogate on the A59. At the roundabout take the second exit, A658, and follow the signs for Harrogate. Stay on the A658 bypassing Harrogate to Pool and Yeadon. Approx 2 miles past Yeadon turn right onto the A657 round Shipley then take the A650 towards Keighley and Skipton. At Keighley turn left onto the A6035 then left onto the A629. At mini roundabout turn right onto the A6033 then right onto Lees Lane the B6142 into Howarth. Parking: At the Bronte Parsonage Museum Car Park, at Weavers Hill Car Park and also opposite Haworth Train Station. There are public toilets in the Bronte Parsonage car park on West Lane and in Central Park opposite Haworth Old Hall at the bottom of Main Street. For refreshments there are shops, cafes, a fish and chip shop and four pubs in Howarth and there are two pubs at Stanbury.